Give a man a fish, the saying goes, and you feed him for a day. Teach a man to fish, and he eats for a lifetime. The same holds true, I think, in the world of cocktails. Teach a man to make a credible martini, and he’ll stop spending all his time worrying about fish. Several App Store offerings have emerged with the precise aim of teaching you how to make that martini as well as other drinks. I took a look at a trio of cocktail app for Apple’s tablet and found myself raising my glass in tribute to two of them. As for the third app, let’s just say that sometimes I drink to forget. Let’s start the round with Cocktails HD. The $5 app from Pocket Cocktails is essentially a 241-page e-book, containing information on assorted spirits, bartending techniques, and drink styles. You can read through the app in either portrait or landscape views, turning pages with a flick of a finger or with the use of a helpful slider at the top of the screen. With the help of Cocktails HD, you can master everything from making simple syrup to creating a decorative fruit boat to garnish a tropical cocktail. Shaken or Stirred: One of the better features in Cocktails HD is a pop-up window containing links to relevant recipes and techniques. But what if you’re not interested in any of that, and you just want cocktail recipes? Cocktails HD has you covered there. 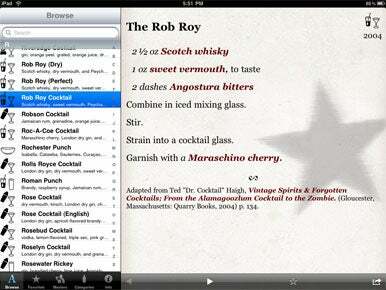 While its 300 or so cocktails are interspersed throughout the text of the e-book—just tap a drink for the recipe card to appear on screen—the app’s home screen lets you jump to a list of drinks organized by type, such as Summer, Tropical, or Creamy. For a more complete list, tap the All Drinks tab for every recipe contained within the app. You’ve even got a search tab at your disposal that produces results as you type (though the on-screen keyboard covers up some of your results, especially in landscape view). If you’re feeling a little lucky, try the Random tab, which produces a random drink recipe when you give your iPad a cocktail shaker-like jiggle. (You can also trigger a random recipe with a tap of a button if, like me, you think the iPad is a little too large to shake.) The recent 2.0 update to Cocktails HD adds the ability to add a little focus to the randomness by turning drink categories on and off. The 2.0 update also broadened the app’s beer and wine contents with “wine cards” that tell you about certain varietals and regions and a food-wine pairing tool that I found a little too rudimentary. Cocktails HD is a gorgeous-looking app—the drink photos are big and bold, and the e-book itself has a font and color scheme that’s easy on the eyes. But there are some interface inconsistencies. On some pages, a tap on the screen summons up a links pop-up that will take you to relevant recipes or techniques—a navigation tool I really appreciate. But the behavior isn’t always the same from page to page. At times, it’s easy to get lost in the app—a dedicated table of contents that would let you jump to specific chapters would be a welcome addition. Still, Cocktails HD provides just the right balance of information. If you want eye-catching, easy-to-follow drink recipes, you’ve got plenty to work with. And if you want to drill down deeper for even more bartending pointers, Cocktails HD offers that, too. Drink-a-Dex for iPad lacks the presentation polish of Cocktails HD. In fact, the $2 app from Robert Bushman is fairly plain and hampered by a rather unfortunate interface decision. 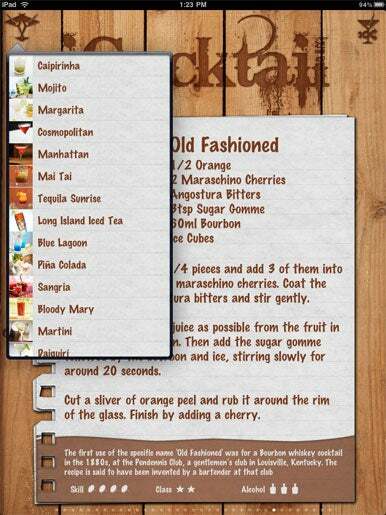 In landscape mode, the left side of the screen features a scrollable pane containing the app’s extensive list of cocktails; tap a recipe and it appears on the right. But flip you iPad into portrait mode, and the recipe takes up the entire screen—with no way to return to the app’s navigation tools until you turn your tablet sideways again. The idea, I suppose, is that the app is a virtual rolodex of drink recipes, and portrait mode acts as the equivalent of pulling a recipe out of the file. (It also makes for easier reading at a distance, the developer claims.) It’s an interesting approach, but not one that matches the way I use my iPad. The Usual, Sir? : Drink-a-Dex gives you plenty of ways to find the cocktail you’re looking for. Star a drink as a favorite, and not only will the app mark the recipe with a star, it will also appear under the Favorites tab. Still, it would be a mistake to dwell too much on the app’s interface, when Drink-a-Dex comes packed with such an impressive volume of content. 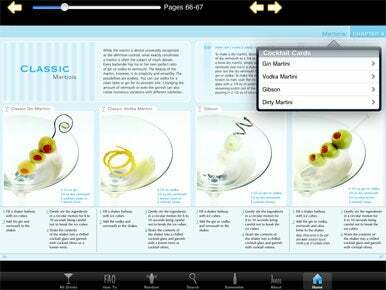 The app claims more than 2,000 recipes, and it’s not an idle boast. You’ll find all the classics here, along with a host of variations and interpretations (three different takes on a Rob Roy, for example, and fans of the Manhattan can sample the dry, perfect, and sweet approaches to the cocktail). You’ll also find a host of obscure and oddly named offerings—the Maryland Squirrel! the Tigers Milk! the Four Flush!—if you’re looking to broaden your cocktail horizons. In addition to that scrollable list, Drink-a-Dex features a search field that returns results as you type. (As with Cocktails HD, the on-screen keyboard blocks some of the results, but if you place a finger on the list to scroll through the results, the keyboard will disappear.) A Categories tab lets you search for cocktails by their base liquor, flavor, tag, or type, while a Masters tab brings up recipes from noted mixologists Jamie Boudreau, Dale DeGroff, and Gonçalo de Sousa Monteiro. A star icon for each recipe lets you designate a particular drink as a favorite—they’ll appear in their own tab as well. In short, if you can’t easily find a cocktail recipe using Drink-a-Dex, you probably aren’t trying very hard. The app is a little bland looking—you won’t find the colorful photos in Drink-a-Dex that make Cocktails HD such a pleasure to look at. But that’s not really this app’s aim. Rather, Drink-a-Dex wants to be an encompassing resource of cocktail recipes. And, spartan design or not, it more than delivers on that aim. Drink It In: The only to search through iCocktail’s 35 recipes is to scroll through the app’s list of drinks. The least satisfying of the three apps I tested was iCocktails. Developer Nift-e Labs says it’s “handpicked some of the oldest and most sophisticated recipes,” which is a polite way of saying that there’s not a whole lot of content to be found here. All told, iCocktails features just 35 drink recipes—in contrast, Drink-a-Dex offers more than 100 entries filed under the letter “A” alone. There’s a difference between selective and stingy, and iCocktails lands on the wrong side of that line. One could argue, I suppose that by limiting its selection to a little less than three dozen drinks, iCocktail might appeal to the casual tippler who just wants to enjoy a simple adult beverage without having to sort through every variation of a Manhattan known to man. But if that’s the case, the app doesn’t make much of an effort to reach out to that audience—it doesn’t explain what kind of glassware you should use for any of its drinks, for example. iCocktails uses milliliters in its recipes, rather than the more U.S.-friendly ounces. At the very least, it should let users toggle between the two measurements. More critically, there’s no way to search for a particular drink, other than scrolling through a pane on the side of the screen. You can’t search for rum-based drinks, for example, or type in a particular cocktail name. iCocktails ranks its drink by skill level, alcohol content, and class (which it doesn’t exactly define), but there’s no way to sort by these categories, either, making me wonder why they were even included. In short, unless you’re looking for a quick, not particularly organized overview of a handful of popular drink recipes, you’d be well-advised to pass over iCocktails. But if you’re thirsting for cocktail knowledge, Drink-a-Dex and especially Cocktails HD will deliver just what you’ve ordered.